Obverse Un drago attorcigliato ad una colonna che riporta il simbolo cinese per 'dragone' e le parole "PAMP 2012 The Lunar Calendar Series Dragon"
Un drago attorcigliato ad una colonna che riporta il simbolo cinese per 'dragone' e le parole "PAMP 2012 The Lunar Calendar Series Dragon"
Placchetta in argento 1 oz 2012 PAMP Suisse Anno del dragone These beautiful 1 oz PAMP Suisse silver bars commemorate the Year of the Dragon, the 5th symbol in the Chinese Zodiac and are encased in a striking red Certicard. The design is quite unique as the front of the bar features a keen dragon wrapped around a column and the reverse of the bar features the same dragon as seen from the opposite side of the column. These bars are perfect for people born in "dragon" years - 1940, 1952, 1964, 1976, 1988, 2000 and 2012 - who are regarded as confident, enterprising, independent, self-assured, brave and passionate. The front of the bar features the Chinese symbol for dragon and the words "2012 The Lunar Calendar Series Dragon". The reverse of the bar displays the fineness, the weight of the bar and the unique serial number and the Certicard includes the assayer's signature and the same serial number and weight in grams. The reverse also feature the PAMP Suisse logo. PAMP is an acronym for Produits Artistiques Métaux Précieux or artistic precious metals products and is a world renowned refiner specializing in precious metals for artistic use. 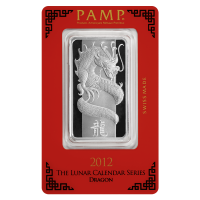 These bars make a great gift for anyone born in the year of the dragon or for collectors of beautiful silver products.